Abstract: The interpretation of the gravity field in the 2D and 3D space requires an accurate Bouguer gravity anomaly map. This requirement is of particular importance, when different techniques, instrumentation and data processing methods have been used in different parts of the area of interest. This paper presents the Bouguer gravity anomaly map of the CELEBRATION 2000 countries (Austria, Czech Republic, Hungary, Poland and Slovak Republic) and reports on the calculation of Bouguer gravity data. The gravity map will serve as basis for 2D and 3D modeling of the gravity field in the CELEBRATION 2000 region (45o–54o latitude and 12o–24o longitude). To avoid truncation problems in the following quantitative interpretation, the map area consists of both the CELEBRATION 2000 countries and adjacent areas. Due to different average station density of gravity measurements in the countries (Austria — 1 station/9 km2, Czech Republic — 1 station/2.6 km2, Hungary — 4 stations/km2, Poland — 2.74 stations/km2 and Slovak Republic — 5 stations/km2) the gravity data were interpolated to grids by using different spacing and projection in each country. In the entire CELEBRATION area the average station density is approximately 2.4 stations/km2 and the gravity data set contains more than 1,620,000 measurement points. Additionally, the most important regional gravity anomaly patterns of the map are presented with commentary. Abstract: Metamorphosed and ductilely deformed conodonts with CAI (Colour Alteration Index) values 5–7 are described and illustrated from Kopaonik Mt, Vardar Zone, Serbia and from Bükk Mts, NE Hungary. They derive from Upper Triassic cherty metalimestones, overthrust by ophiolite complexes. The metamorphism and ductile deformation of the conodont elements evidently took place simultaneously with those of the limestone host rocks, which might have been related to subduction and obduction; however, younger tectonometamorphic events could also have played a role. Unfortunately, illite “crystallinity” indices from Kopaonik Mt are too random for thermometric assessment and geochronological data are missing so far. 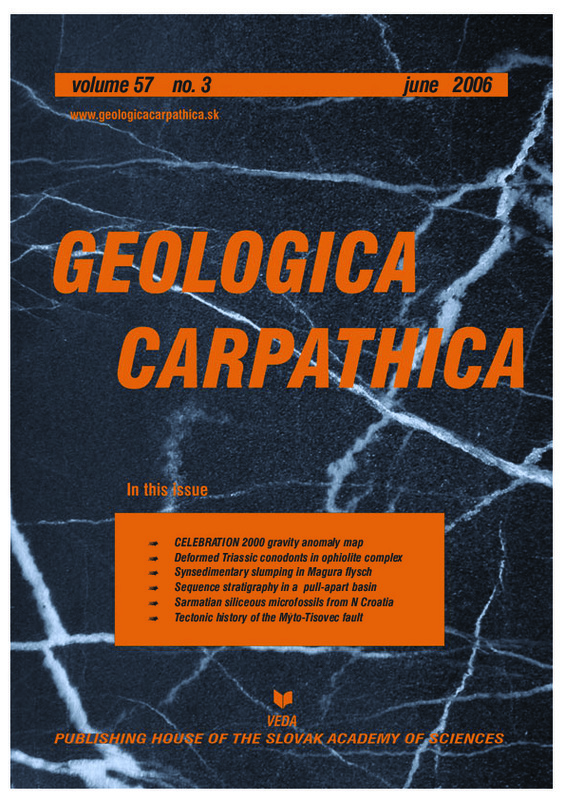 Nevertheless, by comparison with published data about limestone textural alteration and with previously published metamorphic petrological data from NE Hungary, at least a Szendrõ-type (min. 400 °C, but less then 500 °C, temperature and 300 MPa pressure) can be supposed for the regional metamorphism of conodont-bearing cherty limestone series of Kopaonik Mt. Abstract: An accumulation of blocks of thick-bedded sandstones and marls, interpreted as olistoliths, was found in the Beloveza Formation in the SE part of the Beskid Wyspowy range (Polish part of the Outer Western Carpathians). The host sediments are bluish shales and thin-bedded fine-grained sandstones. Some bodies of marls and sandstones, up to several millions of cubic meters in volume and standing out in relief, are also interpreted as olistoliths. The olistoliths were deposited during synsedimentary shortening of the Magura Basin, by submarine slumps moving down the slope of an accretionary prism, across depositional zones. The olistoliths described here resemble in their characteristics and geological position those known from the Kamienica Nawojowska valley. This similarity may suggest that olistoliths may have wider extent in this part of the Magura Nappe. Abstract: This paper presents an improved sequence stratigraphic framework for the southern and central Vienna Basin (Austria) based on the integration of 3D seismic reflection data, well data, surface outcrops and refined biostratigraphy. The 3D survey used for this study is positioned close to the margin of the Vienna Basin, which increases the stratigraphic importance of this analysis. Distal basin facies, so far only known from seismic and well data, are compared and correlated to their proximal equivalents in surface outcrops. The investigated part of the basin is characterized by a syn-sedimentary horst and graben structure, with Badenian (Langhian and Lower Serravallian) platform carbonates on the elevated areas and fine-grained marine clastic sediments in adjacent subbasins. This integrated approach allows the separation of the Neogene sediments in the southern Vienna Basin into five Middle and Upper Miocene 3rd order depositional cycles: the Badenian is separated into three depositional cycles and the Sarmatian (Middle and Upper Serravallian) and the Pannonian (Tortonian) represent one depositional cycle each. The three Badenian cycles are correlated with the TB 2.3., TB 2.4. and TB 2.5. cycles from global sea-level charts. A major sea-level drop of 90–120 m can be calculated for the boundary between TB 2.3. and TB 2.4. at roughly 14.2 Ma. The Sarmatian cycle corresponds to the TB 2.6. cycle and the Pannonian to the TB 3.1. cycle. Since these sequence boundaries are dated in other European basins, their correlation to the Vienna Basin provides improved time constraints for the stratigraphic evolution of the Vienna Basin. The results from this study in the southern Vienna Basin can be extrapolated to the central and probably also to the northern parts of the basin. Abstract: We proposed a biozonation of the Middle and Upper part of the Sarmatian Stage, based on siliceous microfossils (silicoflagellates Distephanopsis soljani–Distephanopsis slavnicii Zone and diatoms Anaulus simplex–Coscinodiscus doljensis Zone). The new silicoflagellate and diatom zones have been correlated with other already proposed zonations for the Paratethys Sea and other marine realms. 46 diatom and 3 silicoflagellate taxa have been determined, that were hitherto not known from the Croatian part of the Sarmatian Paratethys. The boundary between Middle and Upper Sarmatian is supposed to be indicated by the change within the diatom assemblages and by the complete disapperance of silicoflagellates. Tuffitic particles, occurring at the boundary, could also be used as a marker. Likewise a drastic decrease of macrofaunal (molluscs) and microfaunal (foraminifers, ostracods) content is observed. The reason for changes in species assemblages could be in gradual disconnections between Central Paratethys and other marine realms (Eastern Paratethys, links through the Mediterranean to the Atlantic and towards the Indopacific) providing more near shore influence and less saline environment during the Late Sarmatian. Abstract: The NW-SE striking Myto-Tisovec map-scale brittle fault distinctively affects the internal zones of the Western Carpathians. It cuts and evidently offsets Meso-Alpine tectonic units and structures and represents a zone of important geophysical anomalies as well. Using methods of structural analysis, the complex tectonic evolution of this long living fault has been restored. Six successive fault-slip related regional paleostress events, controlling the activity of the Myto-Tisovec fault have been distinguished. The oldest recognized paleostress event, with NNE-SSW maximum principal stress axis operated after the Late Cretaceous and before the Middle Eocene. The orientation of the Miocene maximum principal stress axis rotated clockwise from NW-SE in the Early Miocene to a NE-SW direction in the Middle Miocene and E-W direction in the Late Miocene–Pliocene. NNW-SSE trending compression has been estimated for the Quaternary stress field. Correspondingly, three periods of Miocene tensional paleostress events with NE-SW, NW-SE and N-S orientation of minimum principal stress axis has been restored as well. The Myto-Tisovec fault kinematically fluctuated in the changing paleostress field. However, the most evident structural records are related to the dominant dextral strike-slip regime. Dextral transtensional tectonic regime was responsible also for opening of a narrow and deep depositional depression — the Brezno Basin, related to the Myto-Tisovec fault, where the Late Eocene–Early Miocene sediments of the Central Carpathian Paleogene Basin (CCPB) fill have been deposited and later preserved.